There are many like it, but this one is MINE. My rifle is my best friend. It is my life. I must master it as I must master my life. My rifle without me is useless. Without my rifle, I am useless. I must fire my rifle true. I must shoot straighter than my enemy who is trying to kill me. I must shoot him before he shoots me. I will... My rifle and myself know that what counts in war is not the rounds we fire, the noise of our bursts, nor the smoke we make. We know it is the hits that count. We will hit... My rifle is human, even as I, because it is my life. Thus, I will learn it as a brother. I will learn its weaknesses, its strengths, its parts, its accessories, its sights, and its barrel. I will ever guard it against the ravages of weather and damage. I will keep my rifle clean and ready, even as I am clean and ready. We will become part of each other. We will... Before God I swear this creed. My rifle and myself are the defenders of Humanity. We are the masters of our enemy. We are the saviors of my life. So be it, until there is no enemy, but peace. The G36 is a very light rifle. It is surprising how light it is when you first pick it up. 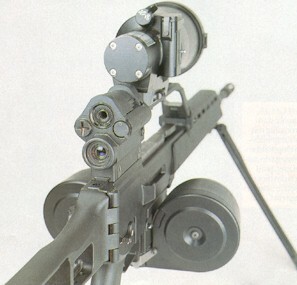 Most all parts of the rifle, with the exception of the barrel, bolt assembly and the internal rails are polymer. The G36 is available with either a dual sighting system (Picture No.1) or with a single 1.5 power reticule. The dual system has a red dot sight above a 3.5 power reticule. This red dot sight is battery powered, but with a sliding window on top of the sight, ambient light can be used during the day for battery conservation. To maximize the effectiveness of magazine availability by making a magazine well that will accept the standard M16 series magazines as well as it's own 100 round dual snail drum. The overall length of this rifle is 33 3/4". This rifle is only available through law enforcement, the German military, or black market.